Matlock Electric’s Asset Condition Monitoring Services (ACMS) will help you with your reliability program and reduce your unplanned down time. It’s not an expense, it’s an investment. 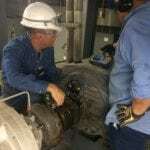 A regular ACM program will identify equipment defects such as early bearing defects, coupling mis-alignment, gearbox defects, poor electrical connections, air and gas leaks, and much more. These defects that are difficult to find result in your machinery going down causing high losses in money and time. ACMS gives you a head start, allowing our team at Matlock time to diagnose and solve any issues developing within your electric motors or the machines they run. Know what’s going wrong within your machines before they fail! Contact us at 513-731-9600 or visit matlockelectric.com/acms for more information.